I just finished ranting about "mom hair" and how to perfect it in a way that it seems like intentional "French" hair (aka messy, stringy and out of control in the most controlled manner possible). 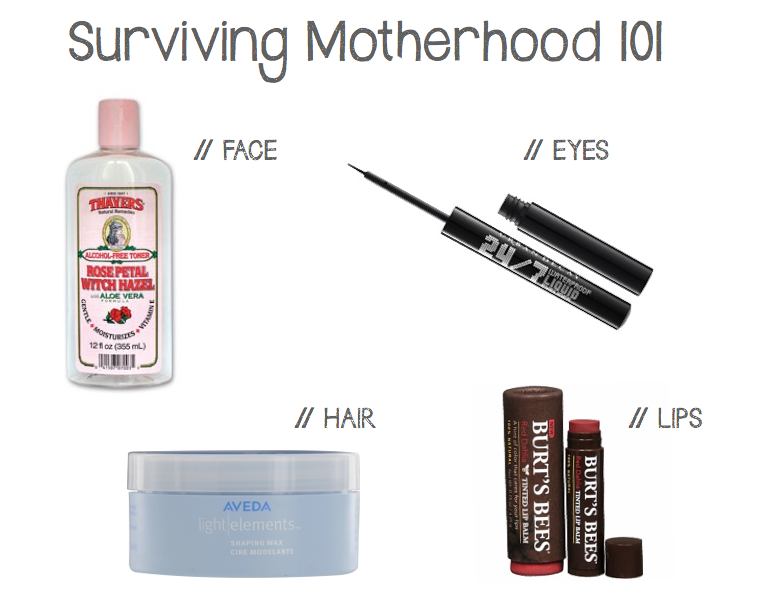 Well that got me thinking and I realized there are four things I rely on to survive motherhood and come out looking somewhat decent. I felt it was my obligation to share. No matter what I'm wearing (within reason), as long as I've used these four magical items, I feel so much more presentable. I've got a dry face, so if it doesn't feel soft and suple my day is off to a terrible start. I've used plenty of moisturizers, mostly natural ones from the health food store. While I still use them I find that this particular rose & witch hazel toner makes my life that much better. It seriously kicks the dry feeling to the curb but also deals with redness and all that uglyness. Best stuff in the world, and completely simple, non-gross or questionable ingredients-y. Obviously the second most important thing. I barely get to dry my hair these days, let alone shower. So most of the time I'm dealing with air dried, borderline out of control waves. Most often than not, I'm dealing with the "dried in my sleep" or "second day mess" version of the above described hair. So what do I do? Basically, if I'm lucky enough to have about 9 minutes for myself, I brush the mess and then take a curling iron and haphazardly run it through the brushed mess. I then use the Aveda styling wax and rub it into the hair. At first, it looks like a sad Barbie doll after sitting at the bottom of a toy chest for months, but it takes a second for it to settle and then the mess starts to look ok.
To look awake, you're eyes have to seem open. For me, a cat eye liner is what does that. So I swear by this liquid liner. It's the best. It doesn't fade, or rub off. I usually just line my eye with a slight wing tip and voila! I don't even feel the need to use mascara anymore. Never thought I would utter those words, but here we are. I love a bold color, but let's face it, when your kid is clawing on your face, rubbing his slobber on you and smearing it with his awesomely fat fingers you start to look like a clown in a horror movie. So that's where tinted lip balm comes in. It gives a little color and shine without being a mess. And there you have it. The four items I swear by to look better on any average day. I still enjoy those bold lipstick moments, but this stuff is definitely great for looking good the rest of the time.